The smartwatch craze has gotten a little out of hand, if you'll pardon the pun. Various manufacturers and innumerable crowdfunding campaigns seem ready to leap into the shallow waters already populated by Pebble, Sony, Fitbit and the like. 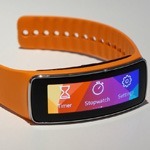 Just because Samsung's Galaxy Gear is the most mainstream of these wearable devices doesn't mean it's the best - on the contrary, in addition to general dissatisfaction with the somewhat rushed hardware, many reviewers found themselves questioning the need for a relatively powerful and feature-filled device on their wrist. After all, there's already one in your pocket. 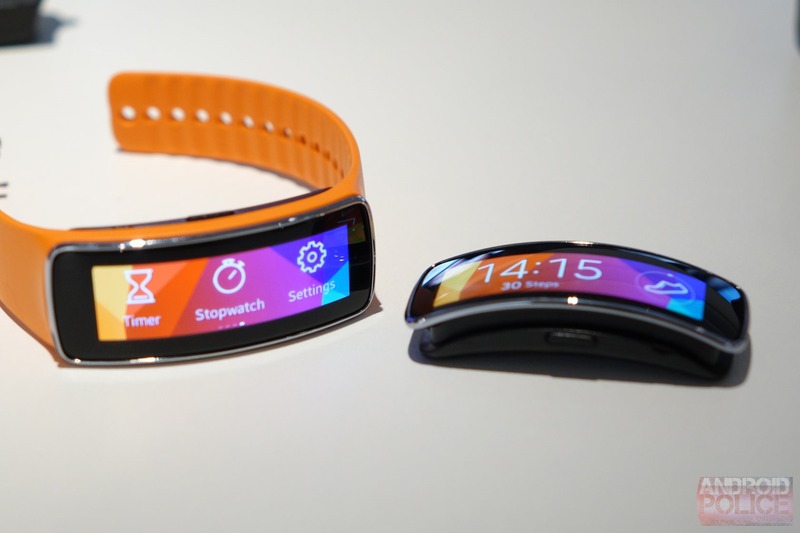 Enter the Gear Fit, a little brother to Samsung's newly-announced Gear 2 and Gear 2 Neo, and a stepping stone between more passive devices like the FitBit and the Jawbone UP. 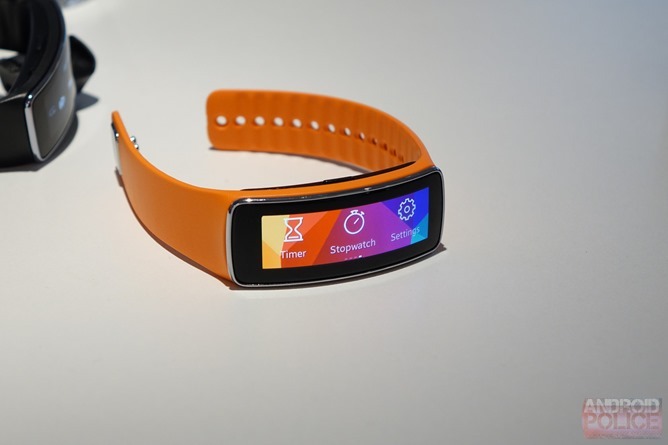 Its smaller size and bracelet-like dimensions make the Fit a more natural device for fitness buffs, but its color Super AMOLED screen and punchy dual-core processor means it's also capable of interacting with your smartphone and relaying notifications. The Fit is a happy medium between a smartwatch and a fitness accessory, and I think that the smart omissions from the former make it a much more practical and usable device. The Gear Fit is about half as wide as the Galaxy Gear, and it also sits higher on your wrist, but its chunky plastic housing follows the curve of the screen so it doesn't feel uncomfortable. The curved screen might not be necessary on a device like this, but Samsung is using the technology to the fullest: with the curve gripping the top of your wrist and following the contour of your arm, the shape and the visuals just seem natural. For a gadget which seems like it's going for the futuristic vibe, that's an impressive accomplishment. The screen itself is excellent, despite a relatively low resolution of 438x132. (It's under two inches long. It doesn't need any more.) It's every bit as bright and vibrant as the screens on Samsung's smartphones, with plenty of pop in the whites to see time and text even on a vivid background. Using the device is based entirely on taps and gestures, the latter of which works especially well on the wide screen that follows the band. Again, the elongated shape and the curve in the screen just fit with the overall design in a way that none of the current square-style smartwatches do. Swiping left and right on the horizontal screen to get through apps and menus makes sense. Of course, the capabilities of the Gear Fit are somewhat diminished. The Fit has no telephony, no integrated microphone or speaker, no camera, no infrared blaster. Those who want a mini smartphone on their wrist will be mortified at this lack of utility, but it's kind of the point: like the Pebble, the Gear Fit has very little that it doesn't actually need to have. It does three things: collect fitness information, relay notifications from your smartphone, and (oh yeah) tell time. I think this focused approach to function is one that actually follows form, and one that will please more users than the larger Gear designs, especially if the price is right. The software integrates pretty much everything you'd want in a fitness tracker, starting with the heart rate monitor hiding underneath the plastic housing. It takes a little time to get started, but once it does it's fairly reliable with a refresh rate of about once per second. Other standard features include a pedometer, a stopwatch and timer, and a sleep tracker. The hardware hides an accelerometer and gyroscope (for automatically turning on the screen when you raise it). The battery is 210mAh, which Samsung claims will last 3-4 days with moderate usage. Charging the Gear Fit is a bit of a chore, thanks to a die-sized cradle that must be snapped on to the bottom of the device to activate the contact pins. Despite the exposed contacts, the Gear Fit has an IP rating of 67, meaning it's up for a dunk or two in the sink or the dirt (but probably not an extended swimming session). The device can be removed from the very simple strap with a solid push, and other strap colors are available, but this is not a "fashionable" gadget - I can't see anyone using it as part of their eveningwear ensemble, which is at least plausible with the Gear 2's metal housing. The clasp itself is a simple pair of prongs that poke through pinholes in the strap. Effective, but not elegant. When it comes to talking to your phone, the Gear Fit is somewhat limited... not that it needs much more. Once paired over Bluetooth you get the standard call, SMS, email, and calendar alerts, and the Gear Fit can send a "find my phone" alert and control remote music playback. Unlike the new Gear 2 and Gear 2 Neo, it cannot hold local music and play it through Bluetooth headphones independent of a Galaxy phone. Other software features include basic settings like brightness control and screen timeout, and a few personalization options like font, clock face, and background. Other functions, including specific modes for various activities and sports, require setup on a Samsung phone or tablet. The hardware we played with seemed ready to go, but the software needs a little more time in the oven. We managed to crash the new Tizen OS with an ill-timed tap of the tiny Power button (which isn't used at all once the Gear Fit is on). We also saw some inconsistent behavior with the auto-rotate function, so I hope Samsung can work out the kinks before release. There's only one other thing I'd like to see added to the fit: a vertical rotation option, which lets you view the elongated screen in portrait. Reading the time in landscape feels odd when you're used to reading a watch face that's rotated 90 degrees compared to your arm. 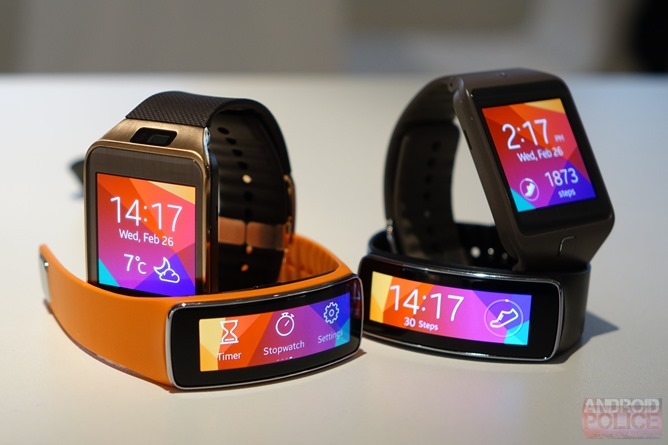 Assuming that the Gear Fit will be marketed at a price that's significantly lower than the Gear 2 and Gear 2 Neo - and I don't see why it wouldn't be - I expect it to do well alongside the Galaxy S5 and other current Samsung products. If the company can get the hardware below $100 at retail, it will be an easy recommended pair with a new Samsung phone (like the other Gears, it won't work with anything else). 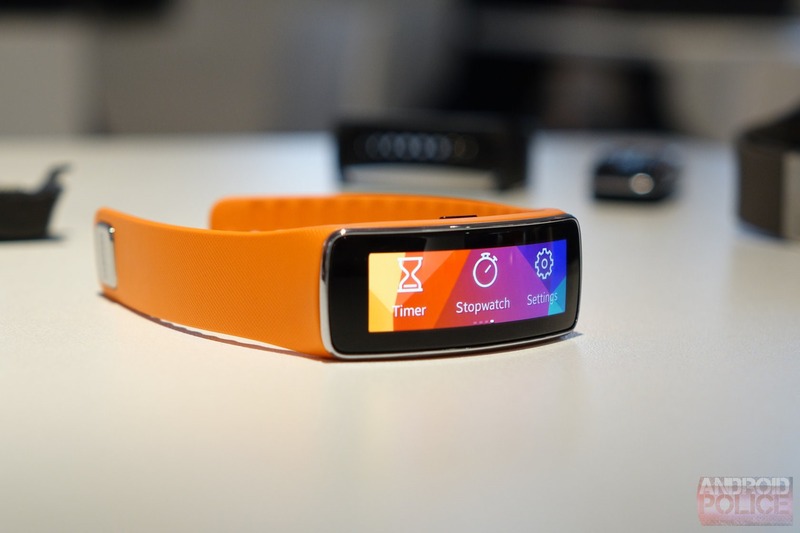 The Gear Fit is scheduled to launch worldwide on April 11th.